With an unexpected discovery, Emory scientists working in David Katz's lab gain a new understanding of the pathology behind Alzheimer's and Parkinson's diseases. Illustration by Ray Scott. No one expected the mice to simply drop dead. But they did. 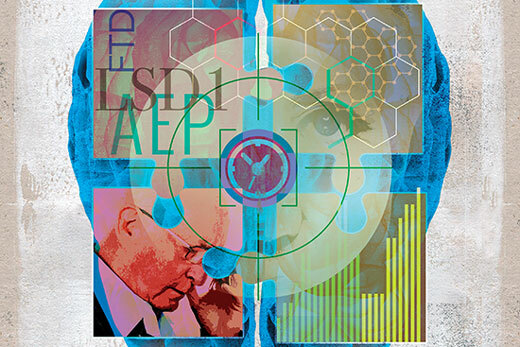 Their sacrifice led to an encouraging new direction in Alzheimer’s research at the Emory laboratory of David Katz. In another campus research project, Emory scientists led by Keqiang Ye 98PhD have identified a therapeutic compound that may arrest the progressive dementia associated with both Alzheimer’s disease and Parkinson’s disease. While following different approaches, both projects are using basic science research to unpack the complex mechanisms underlying neurodegenerative disease and find ways to arrest it. “The biggest risk factor for Alzheimer’s and other dementias is age, and we have an aging population,” observes Susan Peterson-Hazan, the Education Core co-leader at the Alzheimer’s Disease Research Center (ADRC) and a licensed clinical social worker who coordinates Alzheimer’s family education programs offered by Emory. The US Census Bureau reports that 49 million Americans are age sixty-five and over, a number projected to jump to 88.5 million by 2050. The number of Americans with Alzheimer’s, according to the Centers for Disease Control and Prevention (CDC), is expected to rise proportionately from 5.5 million in 2017 to nearly 14 million by 2050. The impact of this massive public health dilemma will be felt in every corner of society and the economy, according to Peterson-Hazan, particularly in the health care industry, state and federal budgets, business, and in the financial well-being of family caregivers. Direct caregiving costs alone could reach $1.1 trillion annually by 2050, the CDC estimates. Then there’s the emotional cost.